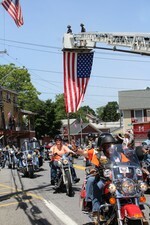 On Sunday, June 7th Highland Falls held its annual Rolling Thunder Motorcycle Ride. This event had over 300 motorcyclists from around the Orange County area and parts of New York State that road around Orange County to pay respect to our military soldiers and veterans. Many of these riders are military veterans themselves that are also a part of organizations that help veterans. The event started at 1215 at Highland Fall's Memorial Park and ended later on at 7PM. The Highland Falls, West Point, and Fort Montgomery Fire Departments all came in support for the event, as well as the Highland Falls Police Department.